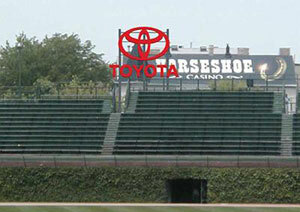 The Cubs want to add a giant Toyota advertisement to Wrigley Field. World-class architectural critic, Blair Kamin, provides excellent insight into why it looks bad. The Toyota ad looks like an alien space ship perched on the edged of the bleachers. Because it’s a dimensional form and not a flat billboard, the ad takes on a sculptural appearance. As a result it resembles some sort of an associated form. The sci-fi Saturn ring forms of the Toyota logo presented in a strictly organized symmetry screams space ship. Take that form and randomly place it on the edge of the Wrigley Field bleachers and well, you have an alien invasion. What alien will land next on Wrigley Field? I can wait another 75 or 76 years. Funny how Blair Kamin compared the sign to Milton Bradley to prove his point about how unwelcome the sign would be to Wrigley Field. When did you leave your comment on Kamin’s blog? It hasn’t been approved yet. My comment was approved a couple hours or so after you checked.